Disabled people hit by the government’s benefit reassessment programme will be able to keep their Motability vehicles for up to six months while they appeal against losing their eligibility, thanks to a new series of measures. The changes will help former claimants of disability living allowance (DLA) who lose their eligibility for the higher rate of mobility support after being assessed for the new personal independence payment (PIP), and are therefore no longer able to stay on the Motability scheme. The need for the new measures has been highlighted by new Motability figures, which show the overall number of its customers plunged by 22,000 (3.4 per cent) to 633,000 between March 2016 and the end of March 2017. This is only slightly higher than the 629,000 customers at the time PIP was launched in April 2013, despite tens of thousands of new customers joining the scheme in the last four years. Last summer, Disability News Service (DNS) revealed that Motability expected 35,000 vehicles – up to 700 a week – to be handed back during 2016 as a result of the reassessment programme. But other new figures, highlighted by the disability charity Muscular Dystrophy UK, show that 51,000 disabled people have had to hand back their Motability vehicles as a result of the PIP reassessment process since it began four years ago. The figures also show that about 900 customers are now having to return their vehicles every week. Thanks to the new measures, some claimants who had their eligibility downgraded following a PIP reassessment and previously had to return their Motability cars, scooters or powered wheelchairs within three weeks, will now have this extended to six months. But Penny Mordaunt, the minister for disabled people, appears to have made no progress on a suggestion she made last November that she wanted to extend the Motability scheme to PIP claimants qualifying for lower levels of mobility support. The Motability announcements, made in a written statement from Mordaunt to MPs, means the package of support already introduced by Motability to help those caught in the transition from DLA to PIP will be updated. Customers who first joined the scheme before 2013 can now return their car within eight weeks of their DLA payments ending – instead of just three – and still qualify for a “transitional support payment” of £2,000, or they can choose to keep it for up to 26 weeks and qualify for a payment of £500. For customers who first joined in 2013, the same time limits will apply but the transitional payments will be £1,000 and £250. All other customers will have to return their car within eight weeks, instead of three. Motability said the “additional time and flexibility will prove helpful to former scheme customers in a variety of circumstances”, including those challenging the DWP PIP award decision and who do not wish to return their car “until they have completed the processes of reconsideration and appeal”. The charity said it was “for the customer to decide whether they wish to challenge the DWP award decision” and the new package was not “in any way linked to their decisions”. Mordaunt originally announced last November that she had “a plan” to help three groups of Motability customers caught up in the reassessment programme. She said she wanted to help those appealing against losing their entitlement to higher rate mobility support. She also said she wanted to help PIP claimants who leave the country for more than 13 weeks, for example to study or take a sabbatical. Mordaunt said this week that such claimants who return to the UK within a year, who have not reached their award review date, and whose needs have not changed, will be able to use a new “rapid re-claim process” – rather than having to start a fresh claim from scratch – that should enable them to start reclaiming PIP within a couple of weeks of their return. Mordaunt shocked many campaigners and mobility experts last November by suggesting that she also wanted to help a third group, by extending the Motability scheme to those who do not qualify for higher-rate mobility support but are only found eligible for the PIP standard mobility rate. They pointed out that recipients of the standard mobility rate receive only £22 per week, compared with £58 a week for recipients of the higher, enhanced rate, which is unlikely to cover the cost of leasing a new car, as well as insurance, servicing, repairs, maintenance, breakdown assistance and fitting adaptations, all of which are covered by the Motability scheme. The new measures announced by Mordaunt this week made no mention of extending the scheme to those on the PIP standard mobility rate. Motability has told DNS that it has no plans to change the scheme to allow recipients of the PIP standard mobility rate to obtain vehicles through the scheme. Declan O’Mahony, director of Motability, said: “We meet regularly with the DWP to discuss a broad range of issues of common interest. Asked if Mordaunt’s proposal had been abandoned, and whether DWP was concerned or pleased at the plummetting number of Motability customers, a DWP spokesman said the department was now bound by the rules of “election purdah… which means we can’t issue new statements on any plans a future government might have, but, as you’re aware, we constantly review our processes to make sure they are working in the best way possible. “As we have said previously, there are more people on the Motability scheme than there were in 2010 and since 2015, 42,000 people on PIP have received cars to help them get around. Meanwhile, Motability celebrated its 40th anniversary on Tuesday with the Queen, the charity’s chief patron, at Windsor Castle. She presented five disabled people with the keys to their new Motability vehicles. 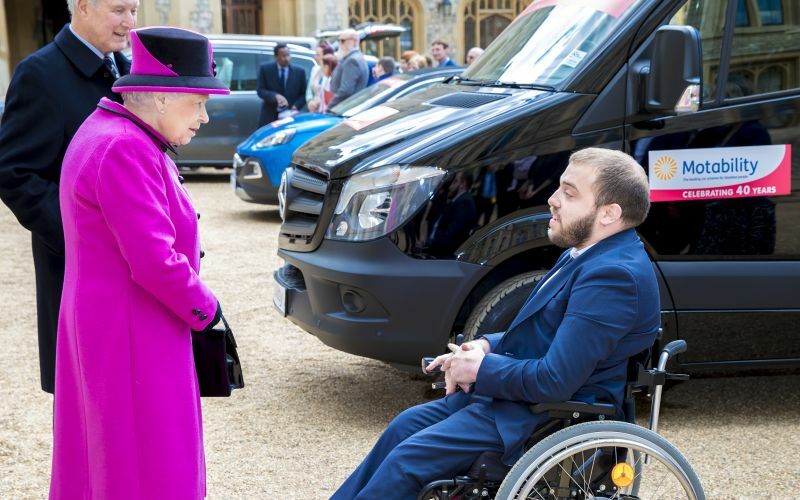 One of them, Edward Todino (pictured with the Queen), a disability advisor at Kingston University, said: “I have always had to rely on other people for lifts, but my powerchair has made this difficult due to its size. The charity has funded both the adaptations to his vehicle and his driving lessons. The scheme has leased 4.5 million cars, powered wheelchairs and scooters to disabled people in exchange for all or part of their mobility allowance since it was established in 1977.